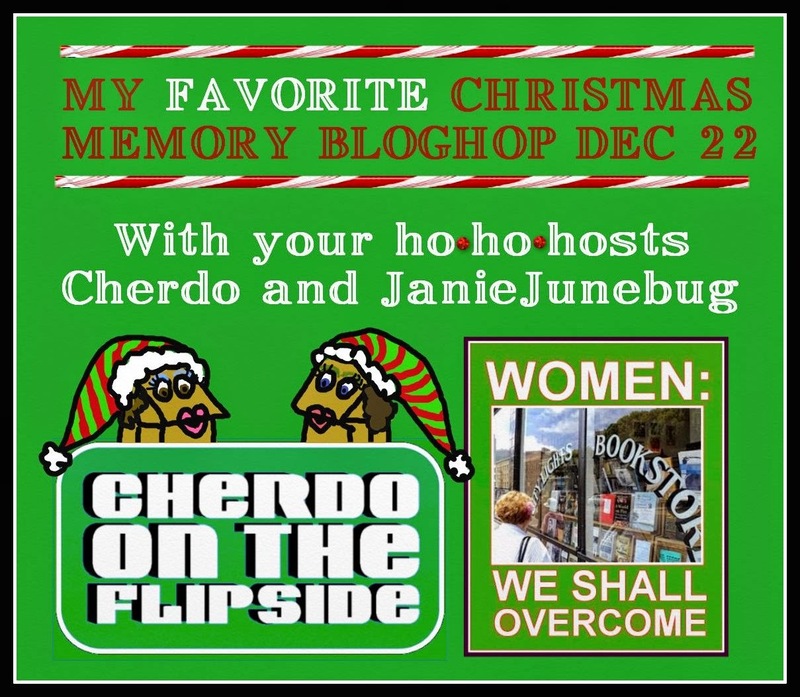 Janie Junebug and I (Cherdo!) would love to hear your own Christmas memories - it's not too late to sign up! To join us, sign up below and then post your personal favorite recollection on December 22. Share the Christmas memory that has stuck with you through the years, and a little bit about what made it so special for you. My favorite Christmas memory is divided into two parts or categories. I'm not sure what to call them, but we have the favorite memory of my childhood and the favorite memory (thus far!) of my adult life. Christmases of my youth usually involved a trip to my great grandmother's house; we called her Nanny. Am I crazy or have I become one of those old geezers who always goes on and on about how it was colder or snowed much more when they were young, because that it how I feel when I tell you it is true! I had the fear of snow getting in the way of the holiday trip but we left on time and I felt giddy all the way. That's saying a lot. Most trips for me involved unforgiving car sickness, but not this time. That, in and of itself, was a miracle. As we drove down the long and twisting country road, my nose was pressed against the cold car window anticipating the first glance of "the farm" as we rounded the last turn. Snow covered the hills surrounding the cinderblock house and the meadow had a white blanket of powder without a single footprint. That would change soon, if I had anything to do with it. Nanny greeted us at the door and announced our arrival to everyone. She was always so excited to see us and you immediately felt her love surround us. No hidden emotions for Nanny. The kitchen table was covered with everyone's favorite cakes and pies. If you ever voiced a preference, she remembered it. Actually, my Dad made the mistake of telling her he loved her lemon cake and she made him his own cake year after year. He confessed to my mother that he was "just being nice" when he complimented her baking skills. Bad move on his part. Soon, all the other relatives arrived. We chuckled at Nanny's Christmas tree, as usual - it resembled a Charlie Brown Christmas tree. It was odd shaped - always. Usually, it was a little sparse because those trees were easy to chop and carry down the hill. I'll remind you, this was my great grandmother, but she knew how to swing an ax, apparently. On this Christmas, she had dubbed a thirteen year old me "the family historian" and made it known that I was the keeper of the stories about the collective "us." In typical grandma-style, she gave me an affectionate nudge and added, "She writes pretty, too." That makes me laugh, even now. I guess good handwriting is the cherry on top. For all my childhood, I would ask Nanny to tell me about every relative she could remember and she would give me names and personal anecdotes. Fascinating stories came forth when pressed for details: like her grandmother seeing Indians in her field, and how they asked for food. Nanny told me that her grandma said they looked poorly and she shared biscuits and leftover ham with them as they told her, "Missus, we will never do you harm...we're just so hungry." As she told these stories, you could tell that she was transported back by the memories and I was absolutely hanging on every word. We both were mentally there, standing outside of the log cabin of her grandma and watching the tale unfold. I loved those stories! And so, when I was about twelve, I started writing them down and that thrilled her. Later, I learned how to do pedigree charts and I would fill in everything I could remember and make extra pages of notes about each tidbit of information she shared. Something about those few moments in the kitchen with Nanny is burned in my brain for all time. I didn't realize it then, but she was giving me a gift at that very moment. By assigning me the family historian role, other relatives would begin to tell me stories and I'd get to interview them and write it in on my chart. Most of the time, I wouldn't even have to ask; you could sort of tell that they were reminiscing with a purpose. Their story needed added to my collection. As the years rolled by, I'd get bits and pieces of shared memorabilia, too - wonderful things. Some of the items I was given seemed like they should have been given to the relatives' children rather than me. A beloved great aunt sent me a picture of her deceased husband from the forties; there he was in his military uniform looking so young and handsome. A crease ran down the middle and she explained that he gave it to her before he went to Europe in World War II and she promised to always carry it till he came back to her - and she did. She folded it to make it fit in a little pocket in her purse. "This is too personal; surely you want to hold on to this," I told my aunt. "But you're the one who loves the family's history; so you should have it," my aunt stressed. Smiling, my great aunt began a story about her childhood home and added that Nanny had told her that I needed to know about her side of the family, since she had "married in." My great grandmother died in 1984, but every time I get a letter with family stories or pictures, I think about her once again and the gift she gave me that Christmas: it was her faith in me to carry our family stories with me until I can pass them on to another family historian - maybe one that isn't even born yet. My favorite memory as an adult occurred after Hubzam and I married. We had purchased a ranch style house in a nice neighborhood and all the kids still lived at home. Juggernaut and Magoo were in school and Gonzo was about four. It was a Christmas when we had decided to stay home and I was so grateful! School activities, shopping, fighting the crowds, bathing the dogs, wrapping gifts secretly, getting the food for Christmas dinner - I was tired. In my humble opinion, my living room looked especially fine that year with my teal and rose Queen Anne furniture and our decorated fireplace mantle. I'd never had a fireplace before - or a room full of matching furniture, for that matter. The Christmas tree sat in front of our bay window and it just looked perfect to me. Juggernaut craved all things musical and had become a bit of a guitar whiz, so his gifts followed that path. Magoo was crazy about handheld electronics and had gotten the latest gizmo. Gonzo got a child sized vacuum cleaner - of all things! He had seen one at a friends house and thought that was the coolest thing in the world. The vacuum cleaner was the first gift he opened and he had to be coerced into opening anything else, as he explained he already had the gift he wanted (did he think he had to choose one from the bunch?). Hubzam sat in a fireside chair with a new book and our dog, Cleo, and our cat, Stumpy, on his lap. Our second dog, Ginger, lay at his feet. As I entered the room to call them to dinner, the family scene of peaceful contentment touched my heart. I was born in West Virginia and most of my family lived there. School years were spent in Ohio, but we always went back to "the hills" for holidays and frequent visits. In 1990, I moved south, but I still felt like home was Ohio or West Virginia. Isn't it weird how adults hang on to that feeling? Are we mentally hot-wired to cling to our original homeplace? At that moment, looking at my family as they enjoyed our home and our Christmas together, I fully felt our place on a new branch of the family tree. I felt the roots that had anchored us. And through thick and thin, even when I wanted to saw away at the branch as I sat on it, I still remember that this family is the center of the mark now - all things in our life ripple outward from it. A switch was flipped on in my brain and the light came on: this is home. You can't do it wrong, Michael - it's your memory! Merry Christmas, dear! You transported me back to when we used to go to my grandmother's for a pre-Christmas dinner. I LOVED hearing her stories and now I love hearing my mother and step-dad's stories. If only there was a wise elderly person to bestow the title of "historian" to me. Thank you and Janie for hosting the blog hop! You're welcome! Janie and I are always available for fun and friends. I'm 50% of what you need - I'm almost elderly! You are the historian of your family and if anyone asked about it, tell them I said so. Good morning and happy hop, dear Cherdo! F.Y.I.- This morning I trudged 20 miles through snow three feet deep just to get to my mailbox! Thank you for these heartwarming memories of Christmas. You were indeed given a special gift by your great grandmother when she appointed you the family historian. It gave you a sense of responsibility, fostered curiosity about your roots and allowed you access to family stories and secrets stemming back through the generations. My good friend and guest blogger Kathleen Mae Schneider assumed a similar role, gathering stories about her mother, 102 year old Margaret, "The Oldest Living Dell Rat," and other members of her family, and sharing them with my readers on SDMM. In her youth and young adulthood, Mrs. Shady also lived in West Virginia as well as in Maryland and Pennsylvania. As you know, I am originally from Pennsylvania. I have lived in Florida more than 30 years and she nearly as long, but we still think of ourselves as northerners. Now, here is a Christmas memory that I would like to share with you and your readers. "THE LAST YEAR I BELIEVED IN SANTA"
"I started out as a child." (Oops, gotta avoid those Bill Cosby references.) As I got older I naturally became more curious and inquisitive. I vividly recall the last year I still believed in Santa. As Christmas approached I cornered my mother several times and ask her pointed questions about the whys and hows of Saint Nick's annual visit. The vague answers and explanations of years past no longer satisfied me. I needed specifics. I needed to know how Santa was able to fly through the air on a sleigh loaded down with tons of toys. I needed to know how he had time to visit every boy and girl all over the world in a single night. I needed to know how a fat man wearing a red suit could squeeze down a chimney and not get stuck, burned or covered in soot. These were legitimate questions that any other 30 year old would ask. Once again my mother somehow managed to tap dance well enough to convince me that Santa was real and that he was on his way. As she tucked me in bed Christmas eve I promised myself that I would stay awake so that I could behold the miracle that was Santa Claus. I held on to consciousness more than an hour but, inevitably, fell asleep and didn’t awake until the morning light. I jumped out of bed, raced to the living room and was elated to discover music playing, tree lights twinkling and presents under the tree. I remember that moment to this day. In that special moment my doubts and suspicions were erased - swept away on a wave of euphoria. I believed. I believed with all my heart that there really is a Santa Claus. “I believe” is a powerful declaration. Believe in yourself. Believe in others. Believe in a just cause. Believe that good deeds will triumph over evil. Believe in love. Believe in Santa Claus. I believe! Your Santa memory was wonderful - I love it. Your Grandmother obviously made the right choice in bestowing upon you the honor of 'Family Historian' because look how well you've worn it! Reading your favorite adult memory made me feel all "Walton-esque". And what in the world is Shecky Shady Shaft going on and on about?! Well, OF COURSE we all believe in Santa Claus! Who doesn't? What half-wit, amoral, social reject DOESN'T believe in Santa Claus? Sheesh! Yak about yakking the obvious! Goodnight, Reindeers in the corral! Ho ho ho, of course we all believe in Santa! Now, here's your plan for this week: Have a Merry Christmas, be safe and stay out of trouble. It's the American way. Wow, what a sweet post. I love that both stories all circled back to family. It's amazing at such a young age that you could appreciate the importance of family history. I can imagine that your grandmother loved that. And the second memory is so lovely, because it wasn't about a big event or an amazing gift, it was just that small, perfect moment of love for your family. We're new here, but we both loved the stories. My own grandma is the family historian, and I look forward to passing those stories on in the future. She actually traced our lineage all the way back to the 1500s with the explorer Alonso de Ojeda, who sailed with Christopher Columbus. So it would be a huge shame to let all of that history go to waste by not passing it on. You are absolutely right! I'm keep close watch on 14,500 on my now computerized genealogy. The historical links are really fun. I'm thinking you might be the next historian - you have an appreciation for the histories and that is the first step. Happy holidays!! Be well and enjoy! Such a FUN bloghop! If I can gather up the time.... maybe later. LOL. Crazy morning and trying to catch up on all my wonderful blogger buddies. Your memories are so precious and WONDERFUL. How cool to have such a relationship with your GREAT grandmother... AMAZING. Michael, that is a great memory!! Don't you just love how somethings stick in your head - in such a GOOD way. I know so many young women who don't cook - they don't know what they are missing and how much their families will love the fruits of their labors. Of course, guys can get on board with this, too - I'm showing my age by assuming the holiday duties fall on women. Thanks so much and I hope you have a wonderful, safe and blessed holiday (how's the new home town?). This was a great idea for a blog hop. I loved your Christmas memories. Your hubzam sounds awesome! Great idea for a blog hop. X- Rays was because of .the digital X- Rays that have a little bit darker ink than the old fashioned X- Ray. Hence the misunderstanding of the darker ink looking like a cavity. My daughter was thrilled too ! I was happy that we have a dentist who is very honest. Such a title--family historian--to have bestowed on you. I hope that in the future we read many stories about your family. You West Virginians are good people. Wonderful memories, both. Isn't it lovely how Christmas draws our memories to the matriarchal figures in our lives? They are the ones who have fostered that concept of "home" in our brains. I love both your stories. My aunt is the family historian on my mother's side. She has all these old letters from our ancestors, diaries, ephemera. Family history can be so interesting. Hi Cherdo! I can't believe I'm just now seeing your blog. Oh well - looks like I have the best for the last!!! Love the history that families make. You have some great "pet" names for the kids. Truly - there is no place like home. May you forever enjoy it. Merry Christmas and thank you for this wonderful bloghop experience! Your "Nanny" was a wise woman to bestow that honor upon you! I also would love to hear more of your touching family stories. In high school when the mini-series "Roots" was on TV, our assignment was to write about our family roots. The teacher said we would get our papers back at the end of the year, but we never did. To this day, I wish I had fought harder for our little piece of history. Cherish your family journals, as your loved ones will always be grateful for these precious memories. Merry Christmad to you, and your family, Cherdo!